1 SLICE CHORIZO. Wash and dry all produce. Slice chorizo into 1/4 inch thick rounds. 2 CRISP CHORIZO. Heat a large pan over medium heat. Add chorizo and cook until crisp and some oil releases, 2-3 minutes per side. Remove from pan with a slotted spoon and set aside on a paper-towel-lined plate, keeping as much oil in pan as possible. 3 COOK CHICKEN. Return pan used for chorizo to medium heat. (TIP: If pan seems dry, add a drizzle of oil.) Season chicken all over with salt and pepper. Add to pan and cook until no longer pink in center, 5-6 minutes per side. Remove from pan and set aside. 4 PREP AND COOK VEGGIES. While chicken cooks, core and seed bell pepper, then thinly slice. Halve, peel, and dice onion. Mince or grate garlic. Cut lemon into wedges. Trim, then thinly slice scallions, keeping greens and whites separate. Add a drizzle of oil to same pan over medium heat. Add onion, garlic, bell pepper, scallion whites, half the chorizo, and Southwest spice. Cook, tossing, until veggies are just softened, 3-4 minutes. 5 SIMMER RICE. Add rice to pan and stir to coat. Stir in 1 cup water, stock concentrate, and a pinch of salt. Cover and reduce heat to low. Cook until tender, 15-20 minutes. TIP: If your pan doesn’t have a lid, cover it carefully with a piece of aluminum foil. 6 FINISH AND SERVE. Fluff rice with a fork and season generously with salt and pepper. 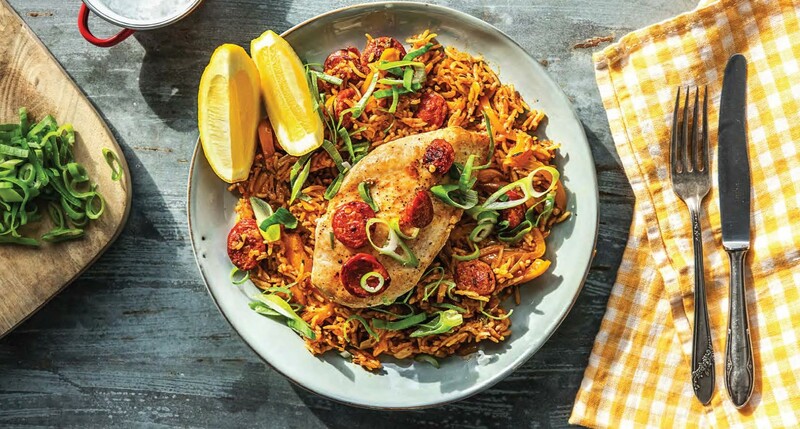 Place chicken on top of rice and sprinkle with remaining chorizo. Remove pan from heat and garnish with scallion greens and a few squeezes of lemon. Divide between plates and serve with remaining lemon wedges on the side.